Some random things I love in my kitchen: old Randy Travis songs, gin, antique glasses full of gin, artichokes, someone else folding the dish towels, shallots, toffee, coffee, and drbabs' recipes. So look here friends: I hit a trifecta! I have been trying, with only moderate success, to cook things on Sunday night that my husband and I can bring for sack lunch during the week. Partly this is to economize -- those $8 Indian food truck plate lunches and turkey in a pita add up fast -- and in part I do so because I’d much rather face my own chicken or pork tacos come 1 PM than a sad cup of soup from the Senate carry out, which diminishes me slightly as a human with every bite. So this week I am going to be pretty excited to dig into my purse and pull out a container of Roast Chicken Breasts with Mushrooms and Artichokes. 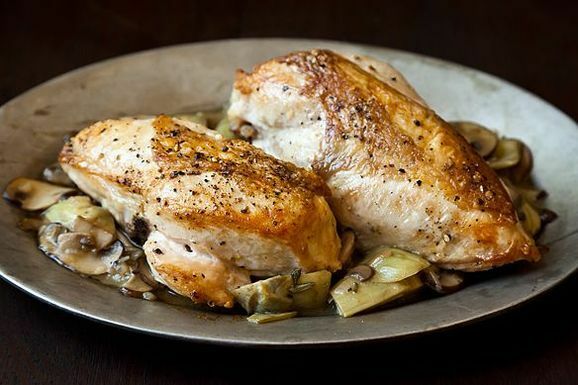 This is your basic browned chicken, finished in the oven with a soft stock-infused sauce, given a fun twist with artichokes and the greatly underappreciated Worcestershire sauce. In fact, can we all stop here to have a moment of silence for this bottle of fun in your fridge, which predates the anchovy craze as a salt zapper, tastes great in burgers, lasts forever and is very, very hard to pronounce. By the time you have your chicken browned up and ready to go into the oven, you should have those shallots and mushrooms cut up (you can buy precut organic mushrooms if you’re really in a hurry; tell whatever would-be Tom Colicchio hanging around your kitchen to hush, or at least open you a beer) as well as your rosemary prepped and your lemons squeezed. If you want to use good jarred artichokes I am not telling your mama. I probably only had a cup of stock in the freezer; no matter my sauce came out perfectly. I think you can also make this sauce without flour but it will obviously be thinner -- a summer blanket for a plate still craving cashmere. All told this is a 30 minute commitment (closer to 15 or 20 if you use boneless breasts) and with a side of, let’s say a nice farro salad, and you’ll be the envy of your block. And tomorrow, your office. I adore both artichokes and mushrooms, so I will be making this dish for dinner this week as well! Thank you for posting the recipe! Absolutely delicious and my family loved it!!! Always look forward to Jenny's recipes! Loved this : "I think you can also make this sauce without flour but it will obviously be thinner -- a summer blanket for a plate still craving cashmere." Perfecta. Holy wow. This was amazing. This was the first recipe I've made on Food52 and it did not disappoint. oh i hope you make many many more! YUM, Jenny! Worst - a - shiiiire is how we say it. i love it in beef stew too! What a terrific recipe - drbabs can be counted on for good ones. Thank you for sharing this one. I'm sure you've been enjoying lovely lunches this week with your leftovers. This was a terrific dinner last night (and my husband appreciated the leftovers for lunch today)! I used white wine in place of chicken stock since I had an open bottle in the fridge and am out of chicken stock in my freezer. It was delicious - next time I'll use chicken stock, but wine is a good sub. Thanks again! You had me @ gin. Recipe sounds divine. Frozen artichoke hearts are THE BEST! I agree. And I can deal with some jarred too. :) Thanks for making my day, sweet Jenny! I found THREE bags of artichoke hearts in the freezer yesterday... we'll be making this this week! My parents come home from a three week vacation overseas on Wednesday. I’ll be making this for their “welcome home tell me all about it and oh, did you bring me anything?” dinner.